Single deck TGVs - Obsolete by design? The TGV Atlantique 10 car sets (which cannot operate anywhere but in west of France) are being withdrawn at a rapid rate. 15 were withdrawn in 2018 and 6 in the first quarter 2019. Clearly few will remain by the end of this year. The 19 TGV POS Lyria sets will be returned to SNCF in December 2019. It is reported that the 4400 motrices will replace the older TGV Réseau motrices on on the Réseau Duplex units ( 601 - 619). Logically, POS carriages will be scrapped along with the old Réseau motrices. Thus within 12 - 18 months from now, the first two types of TGV ( approx 200 sets) will all be gone. it seems that the only single deck TGV's remaining in service at SNCF will be the multi voltage TGV Réseau sets, of which 69 were in service at the end of 2018. None had been withdrawn in 2018. We are not aware of intentions regarding these units. Many Réseau sets are used on cross border services to Benelux, Milan. No new single deck TGV's are on order. An order for 100 new generation TGV Euroduplex sets has been placed with Alstom. They will have an increased capacity of up to 700 passengers. They will no doubt replace the 88 1st generation Duplex units (201 - 297) from 2025 onwards. The demise of the single deck TGVs is not only about their age, but also about their commercial sustainability. In recent years, to compete with low cost airlines, TGV services have had to focus on price. 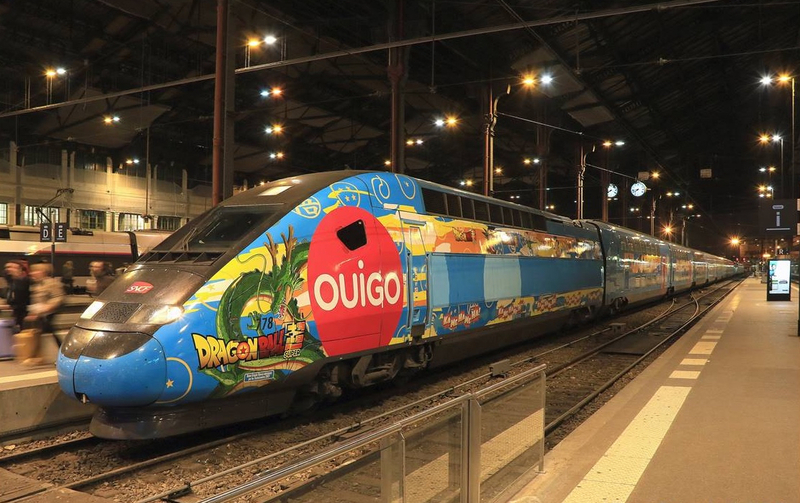 Low cost 'no frills' Ouigo services have been introduced while normal TGV services are often heavily discounted to the point that there is often little difference with Ouigo prices. For this to be commercially viable trains need to carry plenty of passengers for the length of their journey. The duplex TGV literally meets the need for this 'stack it high - sell it cheap ' approach. A single deck TGV set typically provides 345-360 seats, a normal duplex 510 increasing to 600 in a Ouigo set. In the North of France, in the winter 2018/2019 it was learned that SNCF proposed to change the TGV timetable in 2020 so that there would be two "hubs", at Lille and Arras, where all passengers from Paris for Valenciennes, Douai, Lens, Dunkerque, Calais would have to change. There was uproar and the local political objections to the proposed loss of through TGV's reached the transport minister in the middle of the yellow jacket conflict. For the moment, this 'hub" plan is stalled and SNCF is to make new proposals. Photos - Above. Paris Gare de Lyon. April 2000. TGV SE 08 entered service in June 1980. It is still operating (now out of Gare du Nord). 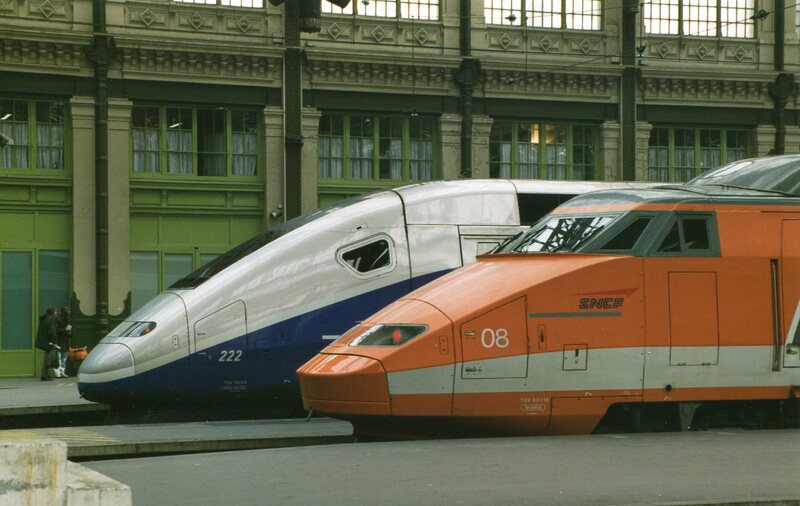 TGV Duplex 222 was built in 1997. It wsa modified in 2012 and is now numbered 293. In April 2019, work will start on Phase 1 to electrify the double track line from Gretz-Armainvilliers to Nogent-sur-Seine (72 km) and the single track branch from Longueville to Provins (7 km). (From Paris-Est to Gretz the line is already electrified). Completion is planned for June 2021. 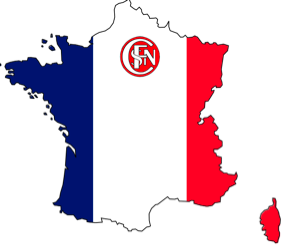 Phase 2 will then start from Nogent to Troyes. Phase 1 comprises the rebuilding of 20 overbridges, the demolition of a short tunnel (105m) and replacement by a cutting, the instalation of 3,000 catenary poles and 230 km of overhed wire for the 25 Kv power supply. 4 overbridges between Nogent and Troyes will be included in Phase 1. Work will take place principally overnight, but certain week ends traffic will be suspended. Regarding the "tunnel des Bouchots" PK 86 at Saint-Loup-de-Naud, the demolition is scheduled during a period of 6 weeks from July 12th - August 24th. During this period, the Transilien LIne P trains will terminate at Nangis and bus services will be provided between Nangis and Provins. The arrangements for the TER trains have not been annouced yet. 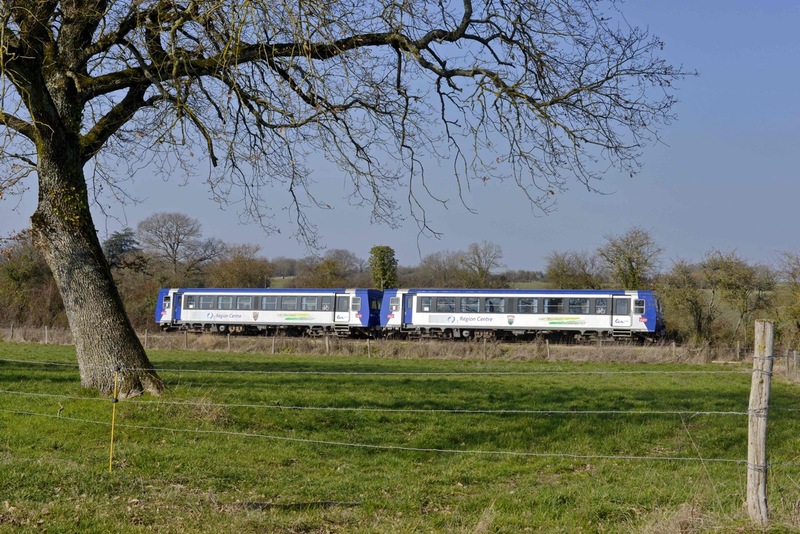 From June 2021, the Transilien AGC BiBi units (Paris - Provins) will be replaced with new "Francilien" Z 50000 emu's. The first two of 44 Vossloh DE 18s for SNCF were delivered to Saint Pierre des Corps at the end of February. The locos were ordered by Akiem, the rolling stock leasing company jointly owned by SNCF and Deutsche Bank. 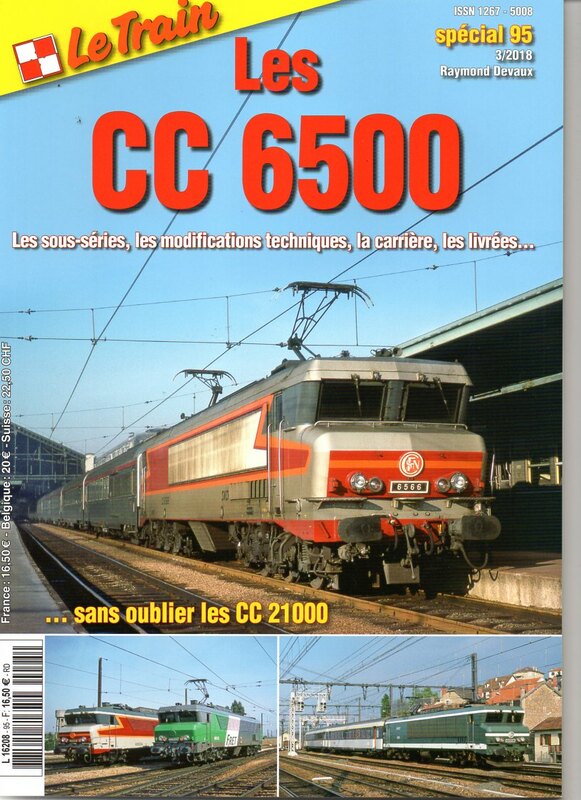 Designated SNCF Class BB 79000 the 2,400 bhp locos will replace the ageing BB 67200 used on LGV engineering and rescue trains. For several years now, winter has been the favoured period for renewal of parts of the infrastructure along the electrified Pyrenean main line from Toulouse to Tarbes (158 km). Normally this line carries 50 trains ( 10,000 passengers) daily. Each winter, the line has to be closed for some weeks. During the winter of 2018-2019, work took place between Oct 15th and March 29th. 1. Labarthe-Isnard pk 80. Dec 18th 2018. G2000 500 1751. ETMF ballast train. on the right, the originai concrete "Midi" catenary posts. 3. Between Montréjeau pk 104 and Lannemezan pk 121. Feb 27th 2019. DE 18 185 004 + 005 haul a ballast train for contractor Ferrotract. Report and photos by Georges Turpin. The latest Le Train Specials as well as several back numbers are available from our sales officer. All prices quoted include UK postage. Order three or more and get a discount of 10% - valid until April 10th. 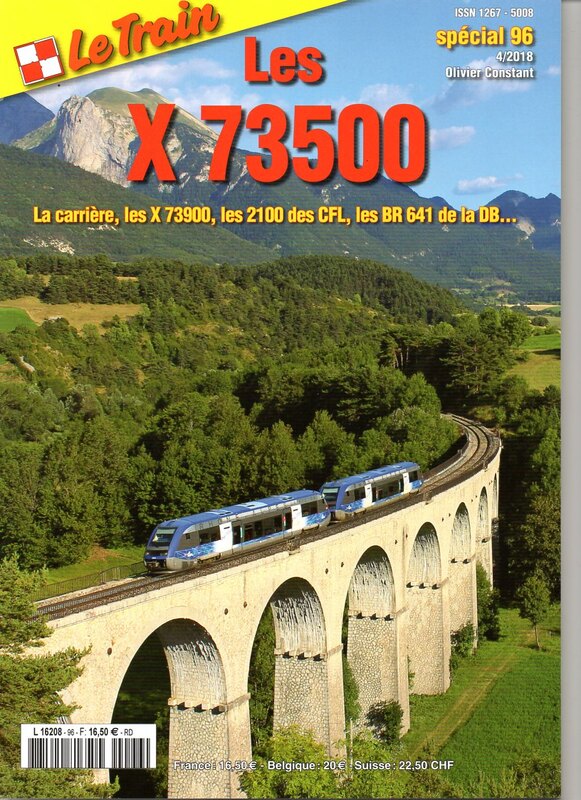 We also have a collection of pre-owned books, timetables and HO scale models from across Europe. Please ask for list. During all the week-ends in March, the inter city trains from Normandy were diverted to the right bank line J, via Conflans, due to engineering work. Embedded among the Transilien services, the long distance trains barely exceeded 60 kph between Saint Lazare and Mantes la Jolie (57 km). 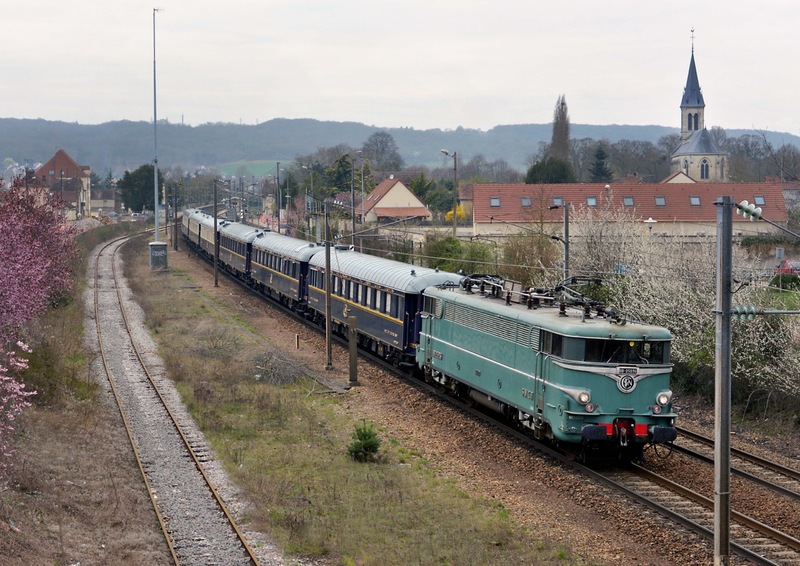 On Saturday afternoon, March 9th, the 13.07 Caen - Paris St Lazare ( IC 3342 ) was photographed by D Michel Costes crawling through Meulan Hardricourt, following a preceding suburban train. BB 15009 has kept its SNCF macaron. The locomotive entered service in 1973. Thirty four of this class operate in Normandie, eleven in Picardie and eleven in Grand Est. Opening of the TGV station under construction on the CNM near Nîmes, has been confirmed for Dec 2019. Passengers arriving by TGV at the new station will be able to change to a local train. 44 regional trains, daily, will stop at NIMES PONT DU GARD (TER) from next December. The journey time to the centre of Nîmes will be 8 minutes. This solution is much better than that proposed at the bypass station outside Montpellier. - the intercité trains will be transferred back to Montpellier Saint Roch and the splendid new station outside the city will be reserved for TGV's. 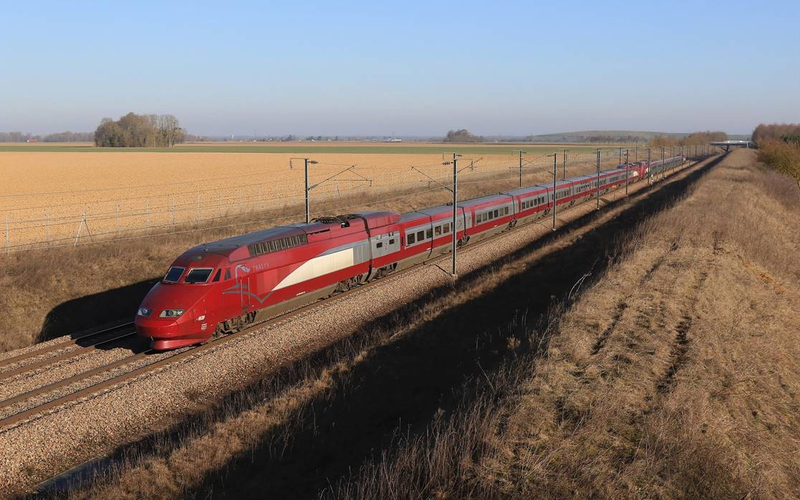 - It has been annouced that 24 TGV's (12 return services) will use the bypass from Dec 2019, stopping at Nîmes Pont du Gard and Montpellier Sud de France. Unfortunately, the public transport access to the new station at Montpellier is complicated - see below. - 28 TGV's (14 return services) will continue to use Montpellier Saint Roch city centre station. Montpellier. The city has one of the larger tramway networks in France; 4 lines, 84 stops, 56 km. In March 2019, the city council voted to create a 5th line that will open in 2022 - 2025. An urgent need is an extension of Tram Line 1 from current terminus at Odysseum to the TGV station "Sud de France", a distance of 1.3 km. It is reported that the line 1 extension would cost 45 million euros. Work is expected to start next year and be finished at the end of 2021. In the absence of a direct connection by tram to the centre, there is a shuttle bus ("Navette") between the new TGV station Montpellier Sud de France and the tram stop "Place de France" (Line 1). If transferring between the centre of Montpellier and the new TGV station by public transport (TàM), travel time is at least 40 minutes to cross between Montpellier Saint Roch Gare SNCF and Montpellier Sud de France TGV station. Take tram line 1 from Saint Roch to Place de France. 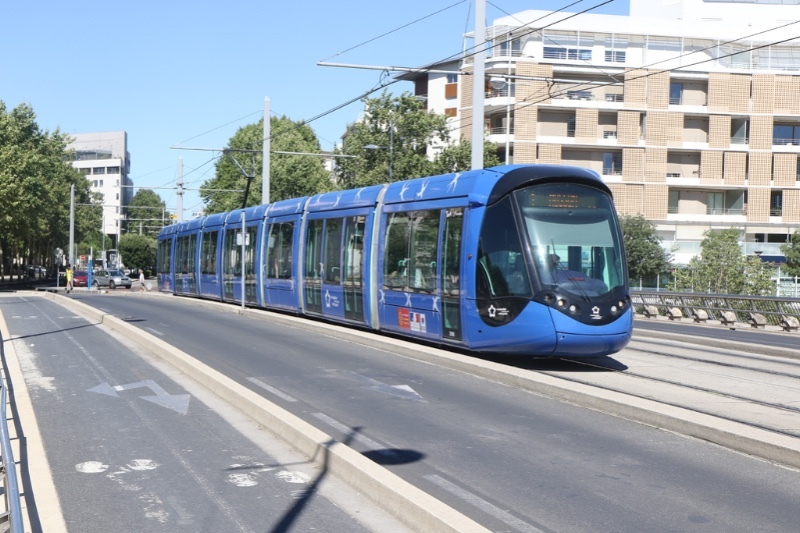 Each of the four tram lines in Montpellier has a different livery on its trams, look for the blue tram (photo opposite) with white seagulls in the direction "Odysseum". There are 10 stops, in 18 minutes. At "Place de France", look for the navette to the Gare TGV (10 minute journey) The shuttle stop is a short distance from the station building. Follow the stickers on the ground ! Compost your ticket on the tram and the shuttle bus. The ticket is valid one hour. In the direction of Montpellier centre, the Line 1 trams indicate Mosson. On February 27th, BB 22275 in charge of a Naviland Cargo Intermodal from Le Havre to Bordeaux speeds through Rosny-sur-Seine, 5 km north of Mantes-la-Jolie in the early spring sunshine. 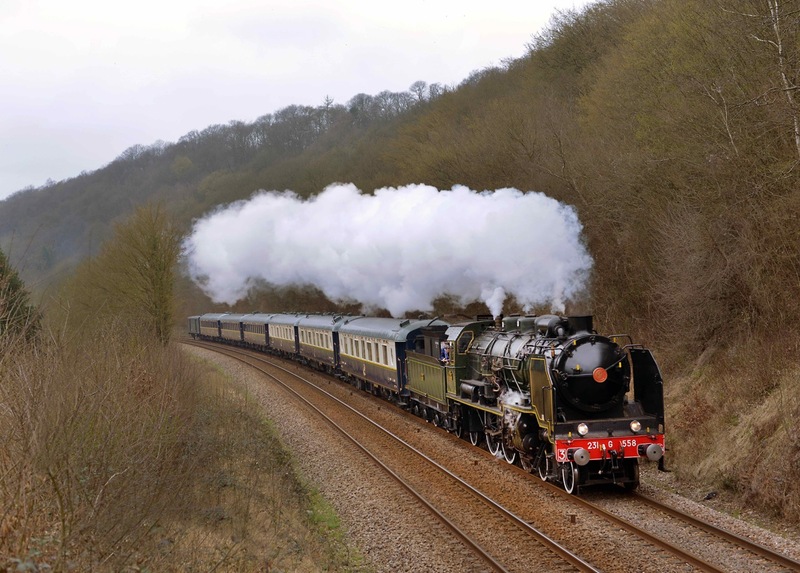 This train runs every week on Wednesdays at present. Following the fire at Figeac station the twice weekly ballast train from the quarry at Blagnac to Lannemazan (Garonne) for engineering work (RVB) between Saint Gaudens and Montréjeau has been diverted. It would normally travel via Figeac and Capdenac to Toulouse, a distance of 300 km. Instead it has been diverted to Aurillac (reversal), Brive then direct to Toulouse and Lanneazon, a distance of 490 km. Operated by Regiorail with hired in traction from ECR 66222 is seen heading southbound on Feb 16th at Saint Jory Toulouse. Photo Georges Turpin. On February 20th, a convention was signed for SABA to use the section from Luçay-le-Mâle to Valençay where the Centre TER, Blanc-Argent trains terminate. The outward service is seen above climbing near Montville on the outward journey. The ECS movements for the Orient Express stock between Villeneuve St Georges and Sotteville were undertaken by CMR's BB 25236 seen above returning on Sunday 24th March at Rosny-sur-Seine. The return journey was delayed by 90 minutes due to the failure of BB 15032 at Bonnières on a preceeding service, it was rescued by Europorte E4009 on a following freight (opposite) All photos D Michel Costes. After a slow down in investment during several years, due in part to a halt in subsidies from the gouvernment, there is an upsurge in work on network extensions and 5 new tram lines are scheduled to open in 2019. These concern Caen (Normandie), Ile de France (T4), Saint Etienne, Avignon, Montpellier, Nice (Côte d'Azur). Caen: In December 2017, the city closed the unsatisfactory TVR guided trolley bus system. The former TVR routes are all being replaced with a standard "tramway on rails" system, plus a short extra branch from the centre. The form of the new tramway network (16.2 km) can be described as two horizontal "Y" 's joined at the tails. It will operated as 3 lines (T1, T2, T3). The tramway passes the SNCF station and serves the city centre, university campus and hospital. It is forecast that 64,000 passengers daily will use the new network. 23 Alstom Citadis 3.05 trams have been ordered. They are medium length (33m), bi-directional, with 6 double doors, and a capacity of 210 passengers. Opening is planned for the beginning of September. A visitor in February 2019 reported that objective would be "tight", much remained to be completed. A 2 km stretch was available for testing the new trams in February (see photo below). On March 19th, for the first time, a tram reached Place de Résistance in the city centre. Opening of the tramway is planned for the beginning of September. Saint - Etienne. This city has the oldest surviving tram network in France, first opened in 1881 and never closed. It is metre gauge. The principal line is through the narrow streets of the city centre. In 2005 a short branch reached the SNCF Gare Châteaucreux. Recently an extension of that branch has been under construction for 4.3 km north past the stadium to reach the SNCF Gare Terrace where the new line will join the tracks of the main north-south line. It is expected that the new network will open at the end of 2019 with three routes (T1,T2,T3). Over 100 000 passengers a day will use the Saint Etienne trams. Avignon After modifications to the original project, a short line of 5.2 km has been built from the SNCF station, Avignon Centre, into the suburbs with a terminus at Saint Chamand near the biggest commercial centre in the region, Cap Sud. Ten short Alstom Citadis Compact trams are being delivered for an opening of the line in June 2019 (see below). There are 10 stops and the journey will take 15 minutes with a frequency of 6 minutes in the peak period. This first phase will be followed in 2023 by a short second line that will timidly creep into the walled town as originally planned. Nice. See previous report in JANUARY NEWS. Ile de France, SNCF tram-train T4. a report is planned for JUNE NEWS. T4 is currently closed until the end of April for technical adjustments, tests and driver training.